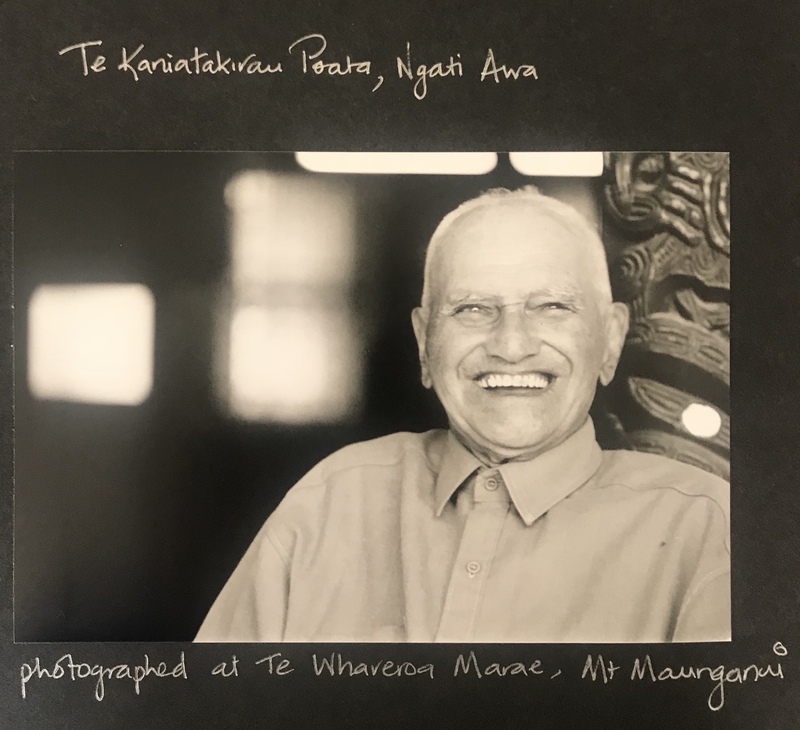 The old man with the light grey eyes lived in the kaumātua flats next to the marae at the Mount and rarely finished his sentences because he assumed you just knew where he was going. 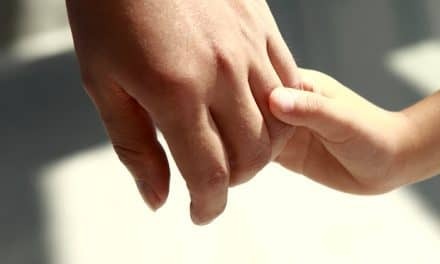 Clutching my hand, he would show me off to his neighbours, introducing me as his “girlfriend”, before leading me into the kitchen of his little house to tempt me with a beautiful array of cakes that had been dropped off by his last visitor. He was 89. When he was 10 years old, Te Kani a Takirau Poata would cradle the heads of women who were having their moko applied by his father Tame Poata, one of the last of the traditional tohunga tā moko to use the chisel. The old man described the scene. Whānau would join the ceremony, singing and chanting non-stop, filling the room with mōteatea to soothe and calm the woman. Hypnotism. Māori styles. Gotta love that generation. Practical bunch. I knew little about moko. Although there were a number in Tūhoe, the only people I had seen with moko were a handful of kuia on the veranda at Tūrangawaewae marae a very long time ago. It was hard not to stare. I couldn’t take my eyes off these living, breathing portals to our past, dressed in black with their backs against the wall, mysterious yet tangible reminders of a world lost to my generation. So don’t use that word tattoo. 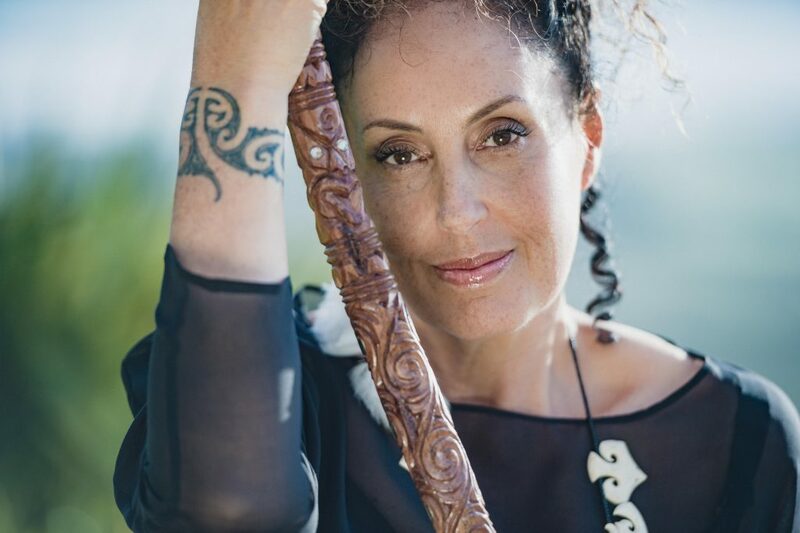 When director Kerry Brown and I started collaborating on music videos in the ‘90s, we were hellbent on showcasing every iconic Māori image we could, to make up for the invisibility of our people across the media and popular culture. AEIOU was the very first NZ On Air funded video. We stuffed it full of Māori design, faces, dance, haka. It was an in-your-face declaration that Māori were still here. I really wanted to pull someone in with moko, but, back in the ‘90s, it was a rarity. One of my girlfriends dragged a big, burly, leather-jacketed mate to the shoot. Despite the blurry images, he owned the last few frames of that video. 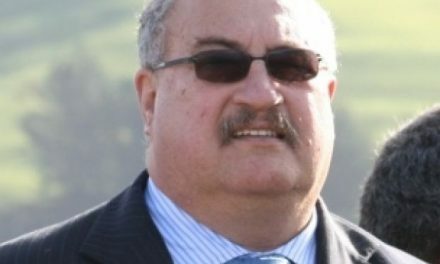 It was Tame Iti who credited the gangs for keeping the notion of the moko alive. Even if their facial tattoos were a far cry from the traditional designs, the concept of wearing allegiances on the face, of using the skin as a canvas to tell a personal story that went beyond design, was a distinctly Māori expression. One of Tame’s most revolutionary acts was to take on the full facial moko himself, to move it out of the gang space and back into the mainstream. I was so angry at seeing this proud Tūhoe man humiliated on state television. 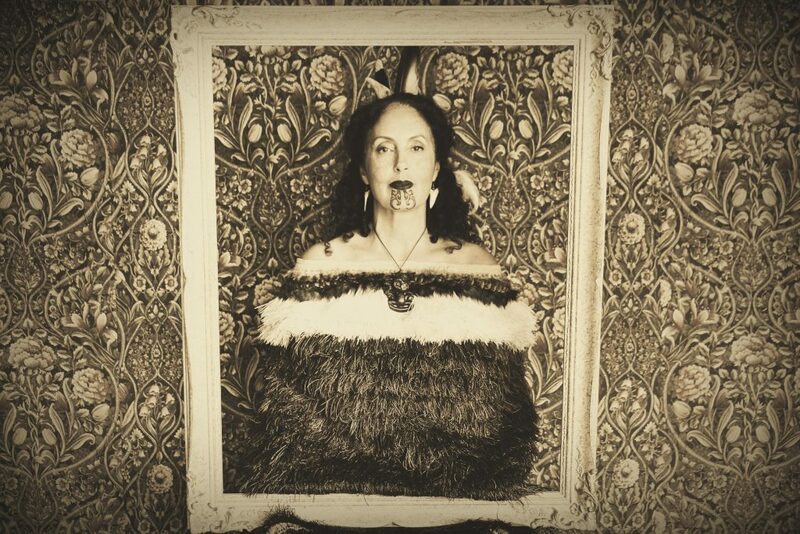 A few months later, our mutual friend Deirdre Nehua told me she was going to receive her moko. Deirdre thought long and hard about how the moko would impact on her life. To her, it was a declaration that carried responsibilities, that required her to behave in a certain way, so she could fully honour the kauae. And then one day, there it was. Beautiful. Deirdre told me her kids said that their mother’s moko was always on the inside. Moko artist Gordon Toi Hatfield had used his skills to draw it to the surface. Inspired by Tame and Deirdre, I hunkered down in a little B&B up in Matakana with a 4-track machine and every book I could find on the subject, trying to understand the difference between moko and tattoo. And then I started writing. to produce a grooved scar. Rangi Kipa and I talked for a while before he reached for his needle. 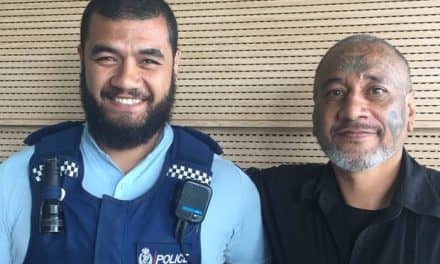 I trusted Rangi to tell my story. He simply pressed the needle into the skin above my wrist. It felt like hot, broken glass being dragged across my skin. I tried to breathe evenly and concentrate on the song swirling in my head, grateful the needle wasn’t striking into my chin, and on my lips. It embraced my arm like a secret, one that only he and I shared. I was the first in my family — my five siblings followed suit. Moko resonates with people all around the world. The international rise of tattoo in pop culture has seen moko appropriated across products by companies who have no connection to Māori. It’s a way of selling stuff. The designer for Ford Motors plonked a moko design across a Ford truck after deciding that the moko represented “strength and pride, it’s a lot like what our trucks are about.” Truly. The makers of The Mark of Kri were looking for a new way to sell their next game featuring a warrior, and they thought the moko made their character look way more “authentic”. There was a heavily pierced white guy I saw strolling along the cobbled streets of Venice with a moko kauae. I thought briefly about telling him he had it all wrong, but decided to have another wine instead. There was the Swedish tattoo artist whose Samoan lover — a renowned tatau master himself — apparently tattooed crude moko-like designs on her chin. And the buff Italian in a market in Naples whose arms were bedecked with moko. I tried to chat with him, but he had no idea what a Māori was, let alone what the designs meant. Then there were the two guys wearing tino rangatiratanga t-shirts and pareu decorated with koru. They had woven kete on their backs, carved weapons protruding. One was carrying a mere pounamu. In the foyer bar of a venue we were playing at. In hindsight that should have been a giveaway. His pounamu hei tiki was bigger than any I’d ever seen. They wore pūhoro. My sister Trina and I were both surprised and delighted. After all, we were in the middle of Europe. “Kia ora! No hea kōrua?” we asked. “Where are you from?” The men looked at each other, shrugged, and laughed. “We are German!” Whoa. Didn’t expect that. They looked more Māori than we do. In other words, I’m more Māori than you. You’re not Māori enough. You’re not a real Māori. The fan had morphed into the adjudicator. Moko is a Māori custom, ritual, and expression. Facial tattoos exist in other cultures, among the hill tribes of Taiwan, the Inuit, across the Middle East and into South America. Each has their own style and significance. But the spirals and lines of moko are distinctly Māori. It is a right for Māori women to wear the kauae, and for males to wear full facial moko and pūhoro. Some of the ritual and conventions may have changed around who can create and receive, but it’s generally accepted that we don’t need to be perfect. We just have to be Māori. While tohunga have declined some of our own, usually it’s good enough for us to be who and what we are. All we need is whakapapa. And whakapapa isn’t measured in percentages. It simply is. Feeling aroha and empathy for Māori doesn’t make anyone Māori. I feel skinny and rich, but a closer look in the mirror or into my bank account snaps me out of my reverie. Pākehā allies exist because they have never felt threatened or diminished because of us. They are comfortable in their own skins. They don’t want to be us or take anything more from us. They understand the history of dispossession and disempowerment at the hands of the Crown and how Pākehā continue to benefit from that. It’s a privilege for non-Māori to wear the markings of our ancestors. The custom of kirituhi was apparently developed by moko artists to enable non-Māori to adorn their skin with our beautiful design. Kirituhi is a special and intimate expression, but it is not moko. Tohunga tā moko drew a line in the sand. We need to hold it. So much was stolen from us, we don’t need to give it all away. Giving Pākehā everything won’t make them love us more. * These are the lyrics of Moko, the spoken-word song by Moana (dedicated to Tame Iti and Deirdre Nehua) which won the Grand Jury Prize of the International Songwriting Contest in 2003. Myra, I feel the same way. For me, moko kauae ought to be restricted to those who can whakapapa to a Māori tipuna. After that, it’s up to the woman, the whanau and moko artist to determine criteria. The Old Man expected those with moko could speak te reo but it’s a different world now. We all have our own standards. My criteria for myself would put me into the “waiting to be perfect category” so I’d miss out completely. Requires a little more meditation! Ae. I hear you. Ki oku whakaaro tonu, ko te reo te manawa o te iwi Maori. He korowai aroha me te marama ki te ao Maori. E ai ki nga korero ka pirangi koe ki te ki ki nga iwi me ako i to ratou reo. 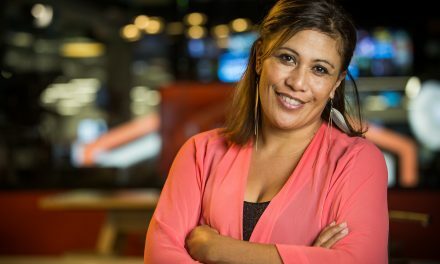 Koira te whainga o taku haerenga. A, ka tuku nga taonga ki nga tupuranga ka tae mai. Ko te kauae moko te tohu ki aku mokopuna – he tatau ki a matou ao Maori. Very beautiful sentiments and reasoning Moana. I guess I am just feeling extremely hurt for our people that this amazing cultural Maori vision is now being appropriated by one and all without any knowledge about what it really means. And I guess it means a whole bunch of things to different people. 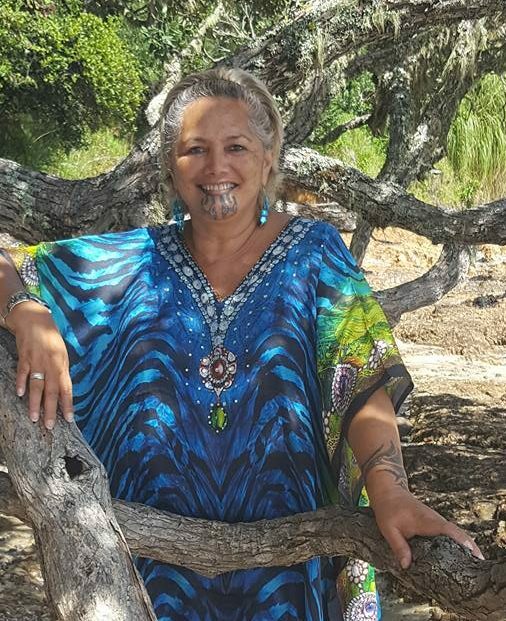 I know, that when I would see our kuia with moko kauae something reverent stirred within my soul and I would be thinking to myself ….”This is someone who REALLY knows who we are.” There was fear and security all wrapped tight in my chest …. pride and mystery brushing goosebumps on my skin. When the earlier debates about ta moko, kauae and kirituhi first erupted on Awesome Maori … nobody was really clear about rules … it seemed to vary from hapu to hapu, iwi to iwi and rightly so. I formed my own rules and tikanga around moko kauae and that is that my children and their children and their children .. shall be well versed in their whakapapa, tikanga and reo before they can adorn themselves with any type of facial moko. And I do this because .. it is my way of ensuring our whakapapa, tikanga, history and reo are respected and kept alive. And when my moko way down the line look at their kuia with the moko kauae (not necessarily me)… they are infused with the same feelings of respect and awe that I had ..”This is someone who REALLY knows who we are.” I do not have a moko kauae and I probably never will because for myself, I do not feel I have earnt it. Whilst I feel very comfortable about my knowledge of whakapapa and tikanga I am still a student of te reo Maori. My daughter however, has beautiful reo .. she could very well be the first, if she chooses, to wear a moko kauae in years to come.